Fresh from being announced as a finalist in the UK Roofing Awards, Elliotts Premier Roofing has completed a £1m contract with one of the UK’s best known brands. Elliotts Premier Roofing was appointed to design & install roof coverings to the brand-new research and development centre in Malmesbury, Wiltshire. In a double win, Elliotts was also appointed to design, supply and install solar panels on the building, with the combined value of both contracts standing at just over £1m. 15 members of staff worked on the project, installing 5,500sqm of Soprema Duo Flex flat roofing and fitting 1,104 separate solar PV panels. The new building has strong eco-credentials thanks to the Solar World panels Elliotts installed. These will produce 300,000kw hours of energy every year and reduce the building’s carbon footprint by 156 tonnes of CO2 annually. The Elliotts Premier Roofing team designed the solar panels using a Ranusol East West System, a new and more efficient way of installing renewables. The research and development building now has the largest system of this type in the UK. Designers from Elliotts Premier Roofing incorporated a number of special functions into their plans to allow the maintenance team to keep the building in mint condition, going forward. 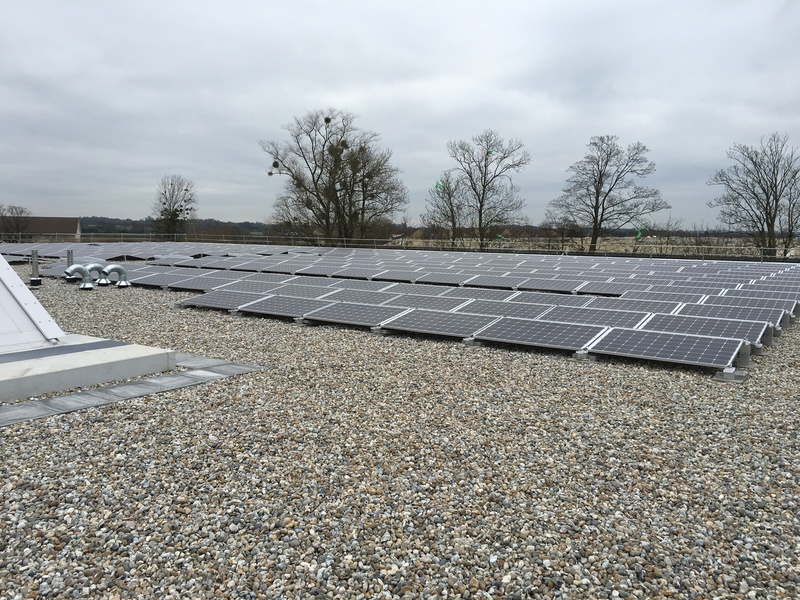 A ‘man safe’ system is fitted to the roof so it can be maintained easily and the renewables team has installed a ‘Solar Edge System’ allowing the company to monitor the performance of each solar panel from a laptop, tablet or mobile phone. The 352kWp solar PV system uses Renusol FS10 mounting systems to give an east/west panel layout. Panels are SolarWorld 280W coupled in pairs to SolarEdge P600 optimiser.